Does your groom crave texture? Complement his unique sense of style with a wedding band that leaves a lasting impression. Our men’s Benchmark titanium wedding ring with polished grooves places an architectural twist on a timelessly classic design. We use only the finest aircraft-grade titanium to ensure that this fashionable ring will withstand the wear and tear of your matrimonial adventures. The sectional design adds an element of dimension to be admired from every angle. Each 6mm men’s Benchmark titanium wedding ring with polished grooves we offer is designed in the comfort-fit style to accommodate men with large knuckles. Comfort-fit bands are aptly named because they are comfortable to wear all day long regardless of profession or recreational interests. Modern grooms are choosing alternative metals in lieu of their precious counterparts because they are much more affordable and come in a variety of stylish hues. Titanium provides a gunmetal alternative to precious metals such as platinum, palladium, or white gold. This lustrous metal is accentuated by contrasting satin and polished finishes that will never lose their shine. The men’s Benchmark titanium wedding ring with polished grooves may measure a half size smaller than traditional wedding bands, because we use extra metal to create a domed interior. We recommend that any groom have his finger sized for accuracy before making any final decisions. 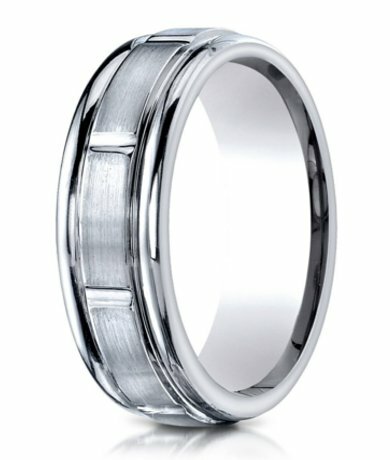 If you have any questions about the 6mm men’s Benchmark titanium wedding ring with polished grooves, please don’t hesitate to contact us for more information or further assistance.